Vincent Lecavalier is the co-winner of this year's NHL Foundation Player Award. Visit the Lecavalier Shop now! Tampa Bay Lightning center Vincent Lecavalier knew he wanted to give back to a special charity. He just didn't know which one. One by one, he went from charity to charity, a headache building as he experienced difficulty determining which one suited him best. Finally, he came to the conclusion that the All-Children's Hospital in St. Petersburg was the perfect fit. With the help of his unprecedented $3 million donation, the Vincent Lecavalier Pediatric Cancer and Blood Disorder Center is scheduled to open in 2009. Because of his tireless work, Lecavalier was the recipient of the NHL Foundation Player Award in Pittsburgh during the Stanley Cup Final. 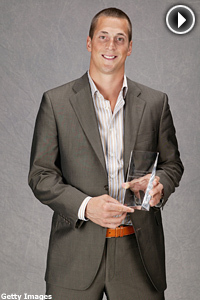 He and Vancouver's Trevor Linden were named as co-winners. The NHL Foundation Player Award recognizes an NHL player who applies the core values of hockey -- commitment, perseverance and teamwork -- to enrich the lives of people in his community. Past recipients honored for their charitable work were: Joe Sakic (2007); Marty Turco (2006); Jarome Iginla (2004); Darren McCarty (2003); Ron Francis (2002); Olaf Kolzig (2001); Adam Graves (2000); Rob Ray (1999); and Kelly Chase (1998). "It's great. I've always wanted to do a foundation," Lecavalier said. "The first couple of years in the League, I wanted to establish myself so I really focused on hockey. After that, my goal was to start a foundation and find somewhere to give the money to. That was kind of a process. Every time I went somewhere, I said, 'I'm going to give to them.' I made a choice and giving to All-Children's Hospital. I really like their vision and where they're going with everything. I'm happy about it." He's also relieved. After making his mark as one of the top centers in the National Hockey League, Lecavalier was focused on doing charitable work. But it didn't happen as quickly as he thought it would. "Hockey guys are really involved in the community," Lecavalier said. "Before starting a foundation, I wanted to be established as an NHL player. After the (work stoppage), I said I'm starting a foundation. It wasn't that easy. There's a lot of work to do that I had no idea about it. I said 'I'm starting tomorrow,' but that's not how it works. You have to choose what the project is going to be and go and see different people." Lecavalier, who is still recovering from shoulder surgery after posting 92 points during the 2007-08 season, was very much a part of the process of this new center from the beginning. He'll even get to voice his opinion, although he said he will leave the final decisions to the experts. "It's more for research. It's exciting," he said. "I went with the hard hat and everything. I met most of the doctors over there and the researchers and what they want to do. I'm happy to be a part of that, and I'll have my little bit of input on what they're doing. I really love their vision." For Lecavalier, it was the facility's ability to allow parents to stay with their ill children that won him over. While the building will certainly be state-of-the-art, he believes the parent-child atmosphere will be what separates the All-Children's from similar facilities. The center will be one of the largest pediatric cancer centers in Florida, occupying half of the seventh floor at All-Children's. "It's going to be pretty great," Lecavalier said. "I really don't know what to expect. Just seeing the patients going in and the families being able to be there with their child, I think that's what it's all about. I'm more excited about that than just seeing the building." Lecavalier, who won a Stanley Cup with the Lightning in 2004, said he is just as proud of his charitable efforts as he is of helping Tampa Bay win a title. He joins a long list of former champions in this area, including Mark Messier, who presented him with the award. "It's even more important, I think," Lecavalier said. "As athletes, we want to give back. A lot of hockey guys do, and they do great at it. I had the opportunity to help out, and I'm doing it right now. It's a lot of fun."